Bacterial wilt devastates food crops all over the world. It destroys major crop plants such as tomatoes, potatoes, bananas, ginger and pepper. It occurs in many countries and attacks over 200 plant species. The bacterium which causes the disease lingers in soil, seeds and plant material for years. It can infect water and farming equipment as well. Plant breeders and farmers would like to know how resistant a cultivar is to the bacterium as early as possible. But so far they have had to plant - and then wait for mature plants to observe resistance in the fields. Now research shows a possible way of saving time and reducing risk significantly for farmers and plant breeders. A new approach promises to forecast cultivar resistance much earlier than was possible before. Researchers can now analyse cultivar resistance at seedling stage for a range of threats. They use plant metabolomics and statistical modelling to decode the plants' chemical defences. Combined with genetic methods, the approach will be useful to identify resistance which depends on several genes, a long-standing challenge in plant breeding. "When farmers buy seed, they need to think about the threats the plants will have to survive. A farm may have drought and heat, for example. If the soil is already infected with Ralstonia solanacearum bacteria that cause wilt, the farmer has two choices, says Prof Ian Dubery. He is the Director of the Centre for Plant Metabolomics Research at the University of Johannesburg. "First, don't plant crops that get attacked by bacterial wilt. Two, choose plant cultivars that are more resistant. If there is drought and heat and bacterial wilt, the farmer wants a cultivar that is resistant enough to all three threats." This may look simple in the age of full-genome DNA sequencing. Analyse all the genes of the cultivars, and pick the ones with the right genes for the threats on a particular farm. But a plant's resistance may not work like that. For one threat, a single gene may switch resistance on or off. For another, several genes may be involved. "It is difficult to see which cultivars are resistant to bacterial wilt. Resistance to Ralstonia solanacearum is a multigenic trait - it depends on many genes - and these are not well understood yet. It will take time before science knows how it works," adds Dubery. Relying on what plants look like can be deceptive as well. When plants are young, it may be possible to tell that a cultivar is unable to defend itself against a threat - that it is susceptible. But eliminating susceptible cultivars doesn't reliably leave you with resistant ones, says Dubery. In plant immunity, susceptibility and resistance can be heavily influenced by environmental factors. With the current situation, farmers risk seedlings dying in infected soil. Mature plants can also turn out less resistant than expected. Plant breeders risk time on improving cultivars which turn out unsuitable for agriculture. For the research article, then-Honours student Dylan Zeiss studied four tomato cultivars. The cultivars show medium to high resistance to Ralstonia solanacearum in commercial agriculture. He took bits of leaves, stems and roots from healthy plants of each cultivar and mashed them up. Then he analysed these mixes for chemicals that the cultivars make to defend themselves. "Plants can develop resistance to threats, such as bacteria, viruses or environmental stresses. But unlike animals, they do not have circulating immune cells in support of acquired immunity," says Zeiss. "Plants use the innate resistance encoded by their genes. They also synthesize a variety of anti-microbial chemicals to counter threats. For each threat, a plant needs to make a different chemical 'cocktail'. The needed cocktail can vary, depending on location, weather and other stresses," he says. 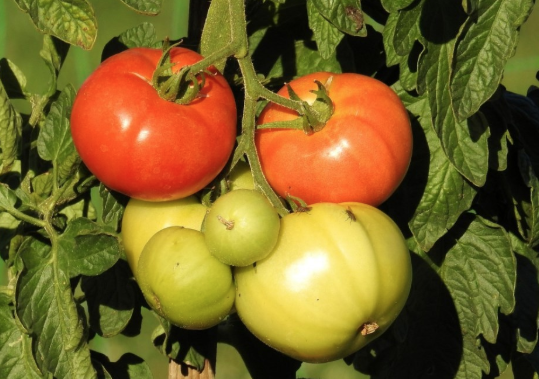 Zeiss analysed 41 of these chemicals, called secondary metabolites, from the tomato cultivars. He used liquid chromatography coupled with high definition mass spectrometry. This showed which cultivars made what metabolites, and how much. Then the researchers ran the raw data through a statistics engine to do multivariate analysis.